There is a really big problem in today’s workforce. Almost no one is passionate about what they do. In 2014, Deloitte released a comprehensive report that found 88% of employees don’t have passion for their work, and so they don’t contribute their full potential. Even worse, they found that 80% of senior managers aren’t passionate about their work. We all know the value of leadership, and how engagement starts at the top, so think about how broken most cultures are. How can we expect employees to give 100% of their effort and go above and beyond when most of the leadership team isn’t passionate? The report is a really good read, but it’s quite long, so I’ll summarize it for you, and break down the most important points. 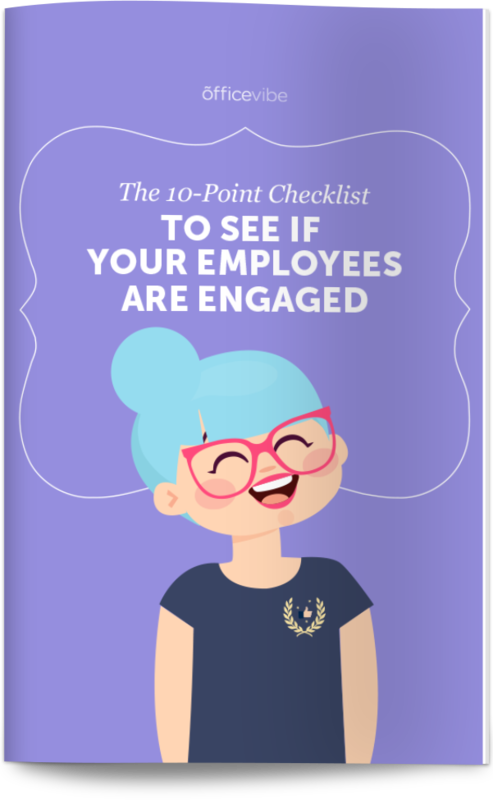 Download the complete checklist to see if your employees are engaged. What Is A Passionate Worker? Before we look at why employees aren’t passionate and how you can help them build that passion, it’s important to understand what a “passionate” worker is. Deloitte’s report explains it very well. This is such a powerful explanation, let’s break it down further. So many companies make the mistake of trying to incentivize work with a quick bonus or perk, but you’ll only get short term results. The secret to long term, consistent success for business is to have passionate workers that are consistently working towards big goals and thinking big. When you’re trying to reach new heights for your team, you need everyone to be able to handle stress well and have a growth mindset where you’re always learning and growing. Why Is Passion More Important Than Engagement? Passion is more long term than engagement. Employee engagement is usually thought of as happiness. Happiness with your work environment, your coworkers, and your boss. Unfortunately, engagement often doesn’t get the kind of results we want. Engagement is usually a small, short term bump in performance. Employees that are unhappy with become a bit happier, you’ll potentially lower your turnover rate and might have a more fun work environment. Passion is much deeper than that. When an employee is passionate about what they do, they consistently look for better ways to improve themselves, their role, and the business in general. There’s a much bigger focus on growth and development. Rather than bumps and dips (with engagement), you get a consistent, steady growth. The problem, according to Deloitte’s report, is that companies aren’t creating the type of environments where passionate workers can thrive. Even if you have a powerful mission and your employees want to grow, many companies are hindering that creativity, eve if they don’t realize it. Companies are missing out on a huge opportunity by being too risk averse. These mistakes are rooted in fear, but companies need to be much more trusting of their employees if they expect to achieve great things. Most employees want to get passionate about their work, they want to master their job, it’s an intrinsic motivation for all of us to continuously develop. For many different reasons (politics, processes and policies, etc.) employees get turned off and lose that passion. So then the question becomes, how do you create more passionate workers? How do we nurture our current talent and make them more passionate? The report from Deloitte gave some tips on what to do, and talks about three attributes to help employees develop. Workers that are passionate about what they do are always looking to connect with others to help them improve and solve problems. Deloitte recommends that you help employees connect with other people at their company, and network with people outside of their workplace. Workers with the questing attribute will always be looking for innovative ways to improve what they do. They’re constantly testing and experimenting with new ideas. Deloitte encourages you to allow employees to work on side projects, or even better, let them choose which projects they work on at work. Passion workers have a commitment to the domain they’re in, and are deeply committed to the work they do. A simple example of this is when a falsely accused criminal becomes a lawyer that fights wrongful convictions. That experience leads them to be more passionate about their work than someone who hasn’t had that experience. Deloitte says that if you promote your purpose and allow employees to hear directly from customers, that can increase their commitment to domain. Here are some of our tips (not from Deloitte’s report) to help your employees develop passion. This is an important tip for both employees and the organization as a whole. In order to have that experimental, exploratory mindset, you need to remove the fear from employees and get everyone in the company comfortable with failure and testing. Read this blog post called Why You Need To Develop A Growth Mindset to learn more about how you can shift to a more experimental mindset. It’s hard for someone to get passionate if they don’t have the autonomy to grow as a person. If someone’s micromanaging, and controlling every move they make, there’s no way they’ll be able to develop passion and feel that excitement for what they’re doing. Read this blog post called How To Hold Your Team Accountable (Without Micromanaging) to learn how you can give employees autonomy while still holding them accountable. You need to actively encourage them to learn and help them by giving them the resources they need to learn more. Set up a budget so they can buy books, courses, and anything that will help them grow. Invest in your employees. Send employees to conferences if it will help them learn and connect with others. Make time for them to learn. Don’t set unrealistic deadlines for them and encourage them to take time to learn. It will benefit you in the long run. Deloitte’s report also gave a few common myths that exist about passion for work. The key thing you need to understand is that everyone has the potential to be passionate about work. Humans are intrinsically motivated to master skills, grow, and get excited about what they’re working on. One myth that they found exists in among many people is that only younger workers could get passionate about what they do. This is a pretty dangerous myth to have because what companies might do to solve this is focus on hiring younger workers, thinking they’re more passionate than older workers. Companies might also be overlooking older workers that have the passion they’re looking for. Their data found that there was no significant difference in any age group they looked at. Younger workers were passionate, but sometimes passion comes with experience. Age has nothing to do with it. It’s really all about creating the right type of environment for passion to exist. Everyone has a vision of a fast-paced, young, cool startup company versus a stodgy, old, corporate company with tons of red-tape holding moving incredibly slowly. But this is just a myth. It’s a false perception. It’s more about a company’s values, policies, and culture. Their research found that large companies were just as good (or bad) at developing passion. Again, what’s most important is how easy it is for employees to learn, develop, and grow. Another myth that exists is that the more educated you are, the more passionate you are. While I can understand why this myth might exist, it’s simply not true. Again, everyone (regardless of education) has the desire and ability to develop that passion. The most important part of building passion is the type of environment they’re in. Getting a university degree has nothing to do with how much you believe in something. This one is half-true. The workers at the top reported higher passion (around 20%), whereas front-line workers reported around 6%, but again, anyone can be passionate. The reason for front-line workers being less passionate is likely because they’re given the least amount of autonomy, they’re the most micromanaged and have the most restraints put on their creativity. So while it’s true that as you move up the corporate ladder, you have more chance of being passionate, it’s more about the type of environment that front-line workers experience. How Do You Help Employees Develop Passion For Work? Do you have any tips to share with the rest of our readers? Let us know in the comments below!